The earliest occupation sites in the parish are demarked by flint pot boiler scatters (NHER 2755, 5679, 5794, 24846). These objects show the inhabitants were heating water for cooking and washing purposes, and many of these sites were discovered in gravel pits or atop Barrow Hill. Flint working was widespread in Thetford in prehistory, with sites recorded near to Brandon Way (NHER 37158) and the Anglia Water inlet (NHER 39843) in Two Mile Bottom. Some of these flint production areas have been dated to the Mesolithic period (NHER 5719 and 5738) from their tool assemblages. The presence of the Icknield Way (NHER 1398), a possible prehistoric trackway thought to have linked Norfolk to southern England, would have helped inhabitants to traverse the landscape, although evidence of its existence is fragmentary and the subject of much discussion. A huge number of prehistoric flint objects have been found in Thetford. Important scatters of Palaeolithic artefacts have been recovered from gravel pits and hilltop locations, with the finds mainly consisting of worked flakes (NHER 5673, 5792 and 34760) and axeheads (NHER 2744, 5656, 5715 and 5800). Due to the presence of the aforementioned Mesolithic sites, a good number of flint tools from this period have been recovered, with a saw (NHER 2753) being one of the less common finds and blades (NHER 15364) and microliths (NHER 15743) representing more typical objects. As is often the case, the majority of the prehistoric artefacts are of Neolithic date. Flint scrapers (NHER 32343), blades (NHER 19267), arrowheads (NHER 5939 and 14930), axeheads (NHER 5809 and 5810), spearheads (NHER 5722) and a macehead (NHER 5721) give a flavour of what has been recorded. The Bronze Age is well represented by a series of round barrows. These exist mainly on Thetford Warren (NHER 42782 and 42783) and on Gallows Hill (NHER 5744 and 5755). This is the first period to provide metal objects, and a couple of metalwork hoards (NHER 16461 and 24606) have been found, one of which included a superb gold torc (NHER 24606). Otherwise a comprehensive selection of artefacts from this era has been recovered, comprising socketed axeheads (NHER 5819 and 5820), palstaves (NHER 5822 and 5823), arrowheads (NHER 17969 and 39506), spearheads (NHER 5824 and 17775), a sword (NHER 28985) and a rapier (NHER 5816). 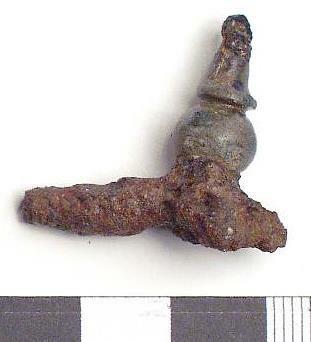 The Iron Age was a significant period in Thetford’s history. Thetford Castle (NHER 5747) was originally an Iron Age fort that was built to guard the point where the Icknield Way (NHER 1398) crossed the River Thet, before being converted to a motte and bailey castle during the rebellion of 1075. An occupation site (NHER 5738) has also been discovered on the site of the modern power station, with a series of ditches and pits and post holes showing the presence of field systems and structures. An Iron Age to Roman period settlement (NHER 5756) has been identified within the area of the scheduled Saxon town, on land now used as a playing field. This Iron Age occupation was identified through a series of pits, postholes and hearths, which were felt to indicate the presence of a domestic settlement. Elsewhere, a number of Iron Age features and a human burial have been reported near to the Ford Place Nursing Home (NHER 40576). Unusual animal bones accompanied these remains and suggest that this may have been a deliberate deposit relating to ritual activity. By the end of the Iron Age the area around Fison Way was rising to prominence. Archaeological evaluations at the industrial estate in 2003 revealed a group of pits (NHER 38138) similar in size, character and fills to two pit groups found 250m to the north that have been securely dated to the Iron Age. The Fison Way site (NHER 5853), excavated in 1980-82, has several phases of Late Iron Age activity and occupation. 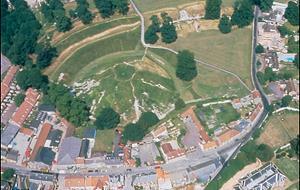 At this time the site took the form of a large square enclosure with a singular circular building. The exact function of the site is uncertain at this time, but it is quite probable that it was an important religious centre. Additionally, evidence for an Iron Age mint has also been found in this area, with a large number of Iron Age coins accompanied by coin moulds and crucibles. A significant proportion of Iron Age artefacts from Thetford take the form of coins, many minted by the Iceni tribe (NHER 19336, 39514 and 16461). Most are made from silver but a fabulous gold stater (NHER 19335) has also been recorded. The fact that so many Iceni coins have been found in Thetford may tally with the idea that the Fison Way site (NHER 5853) was an Iceni power centre during this era. The Roman period in Thetford seems to have been as busy as the preceding Iron Age. Occupation continued at the sites established in the Iron Age (NHER 5738 and 5756). The site at Fison’s Way continued to be used, with the former Iron Age enclosure being replaced by a larger enclosure surrounded by nine timber fences. Inside, there were five circular structures and an entrance to the east via a long timber corridor which terminated in a massive gate. This evidence has been interpreted as the remains of a Late Roman temple, which had replaced the earlier Iron Age religious site, and was possibly associated with the 'Thetford Treasure' (see below). Nevertheless several new Roman settlement areas were established, as evidenced by the remains of buildings discovered near to St Helen’s Wall (NHER 5683) and the discovery of a tessellated floor surface and possible hypocaust on modern St Nicholas’ Street (NHER 5852). Additionally, archaeological excavations in 1991 identified a Roman agricultural site at St Nicholas Street (NHER 1134) with a granary and corndriers being noted along with several Roman small finds. Other agricultural sites were located further from the urban core, and one such Roman farmstead has been noted on land off Brandon Road (NHER 37158). This substantial farmstead seems to have possessed barns, buildings, enclosures and a planned field system. A second area of Roman occupation (NHER 24849) has been noted along Brandon Road, to the west of the Old Golf House. Fewer definite structures were recorded here but a variety of cut features, ditches, pits and postholes as well as prolific metal and pottery finds clearly demonstrate a Roman presence. The large number of Roman artefacts and pottery sherds suggests some manufacturing activities were occurring at this time. Pottery kilns have been reported (e.g. NHER 5738) including one located at Two Mile Bottom (NHER 5730). Indeed, the collection of coins, metalwork and ceramic objects found in Thetford is too huge to mention in much detail here. Unsurprisingly the most magnificent Roman artefacts formed part of the ‘Thetford Treasure’, with this fantastic hoard consisting of gold finger rings, gold bracelets, gold earrings, gold pendants and necklaces, beads, silver strainers, numerous silver spoons and a shale jewellery box. Whether these 4th century objects were votive temple offerings or items belonging to a wealthy individual/guild is currently under debate. Perhaps of more interest is the fact that the assemblage of artefacts is not specific to the region of East Anglia, with no unique object classes or styles present. 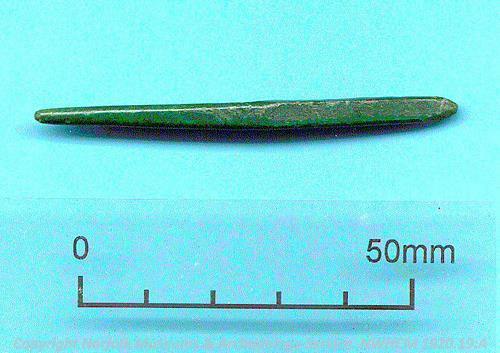 Other items amongst the diverse collection of finds include those of a ritual nature like a facemask (NHER 17396) and various figurines (NHER 5833 and 23746) along with those relating to appearance such as a ladies comb and bodkin (NHER 19248) and tweezers (NHER 5834). Numerous everyday objects have also been recovered and these finds include quernstones (NHER 5836 and 13266), a lamp (NHER 5839), jars (NHER 5732 and 5840) and a mortarium (NHER 33340). Obviously a great number of isolated Roman coins have been recovered, but four coin hoards (NHER 5850, 14825, 16462 and 32349) have also been recovered from Thetford, possibly suggesting the presence of affluent individuals.